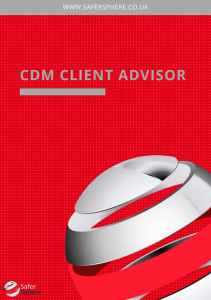 Safer Sphere has an array of experience in delivering the CDM Coordinator role in accordance with the CDM Regulations 2007, and will now be available to assist construction clients in CDM 2015 compliance as CDM Client Advisor. Our experience ranges from minor projects of £20k through to major developments to the value of £500m. Assist in the development of the Client CDM Brief. Provide safety advice and support for the project team. Advise the Client on the suitability of the Construction Phase Plan and Welfare Facilities before commencement and during the project. Carry out site H&S reviews on the client’s behalf at regular agreed intervals. PQQ / ITT H&S question setting for a framework and or project tender enquiries. Client CDM training to assist client representatives in understanding their duties under the CDM Regulations. Preparation of model contract/appointment clauses to hold designers and contractors to their duties and compliance. Why not download our brochure to find out more.